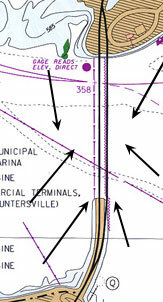 On this page I have outlined a lot of what I know about Jack fishing on Guntersville. You can count on one hand the times I have gone. However, I have had great success during these few trips. I always used chartreuse color round headed hair jigs in the 3/8 - 1oz variety. I then used one live minnow rigged through it's mouth. I also used 15 - 20 pound test Braided Line. I always did my best in water 25 - 35 feet deep. I used may LCR more for jack fishing than I did for Bass fishing. I first set my sensitivity up and always have the highest zoom on. It just took a few minutes to realize the jacks are among the types of fish that leave elongated arches on my unit. Many of the arches took up the whole screen. The map below shows my best area. The mouth of Honeycomb Creek actually comes out below Goat Island. 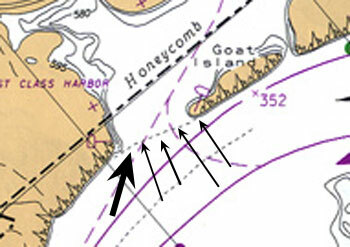 There is a point running below Goat Island which this map does not show but the arrows do. It runs along the river channel side of this point as well as down to where the point empties in to the river. See Big Arrow. I have never tried these two areas but I hear they can be good. There is a big island under the main Guntersville bridge that looks good. Also, fishing the ends of the rip rap areas on the Guntersville side of the bridge should produce some fish.